The other appendix proposes a Harmony Index, consisting of indicators like low suicide rates of children and the elderly, low rates of domestic violence, public trust in politicians, high levels of loyalty to family and of general social trust, and high scores on environmental performance. China gets middling scores on this index, while India and the United States perform worse. Yet China is one of the most conflict-ridden societies on the planet—understandably so, given that its citizens have been put through a dizzying process of economic and social change in the course of three and half decades, wealth is distributed increasingly unequally, the environment is severely damaged, the official ideology is bankrupt, and official corruption is widespread. These are all problems that Bell acknowledges. But he seems taken in by a surface impression of social harmony. “China,” he says, “has many problems, but most citizens perceive China as a harmonious society and the country is more harmonious than large democratic countries such as India and the United States” (p. 60). 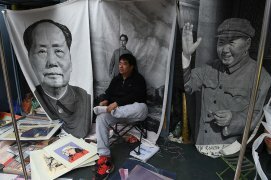 “Of course,” he goes on, in one of those passages in the book that leave a reader’s head spinning, this harmony “relies on force to prevent the open articulation of diverse interests…; [h]ence, political reformers in China argue for intraparty democracy that would allow for internal competition within the CCP…. But full democratization … is likely to aggravate social conflict and forever bury the ideal of a harmonious society” (p. 60-61). In short, the harmony is forced; the flaws of Chinese style authoritarianism can be fixed; adoption of liberal democracy would make them worse.